Flexibility exercises are essential for those looking to increase range of motion and power! What are some of the main differences between you and a professional golfer once you get to the course? Well, other than buying a six-pack and getting a cart, what else? The warm-up! The pros spend hours preparing for their round. Not only around the putting green, but at the driving range as well. They also have a small stretching warmup that they perform to target a few key muscles. What do the rest of us average joes do? We step up to the tee box, take a few practice swings and let it rip! This is one of a handful of reasons why amateurs get injured more frequently than professionals. Have a great stretching routine, or specific exercise? Share with others here! Development of proper neuromuscular control. The two main points on the list that I want to talk about further are muscle imbalances and range of motion. Muscle imbalances have a direct relationship to your posture. Posture can include a wide variety of areas ranging from your neck down to your feet. An imbalance can be related to tight (over active muscles), or weak (under active) muscles. A fitness professional may be needed to help your analyze exactly which areas need to be worked on if you are unsure of yourself. A basic example of a muscle imbalance and its effect on your golf swing would be a tight chest, combined with a weak mid back. This person would present likely with rounded shoulders, and a forward head position. Due to this imbalance, the available range of motion at the spine may be limited which could rob you of rotation and power. Also, altered mechanics may place increased demand on stabilizer muscles, such as the rotator cuff, which could lead to injury. Flexibility exercises are also important for increasing general range of motion. Many of us have tight muscle groups that likely could benefit from a good stretching program. These tight areas, whether they are at your hips, shoulders, or back, could lead to numerous faults such as altered mechanics, lack of power, and even injury. There are two main components to a golf stretching program: home flexibility, and on the course warmup. The home flexibility program will be general in nature, acting as a compliment to a proper strength training routine. It will work on improving length of your soft tissues and range of motion at all major joints so that everything works more efficiently during the golf swing. The on course warmup will be more specific, targeting key areas for the upcoming round. Specific areas that need to be targeted with flexibility exercises are the shoulders, elbows and forearms, neck, back, and hips. If you check out the golf injury page, you will notice that these stretches are all focused on the most frequently injured areas. A solid golf flexibility program will help prevent injuries such as rotator cuff tendonitis, tennis elbow, golfer's elbow, and low back pain. Each one has their own role and should be utilized at specific times. Remember, there is a difference between stretching and warming up! Stretching is typically done statically, where you hold a position for an extended period of time. Static stretching plays a significant role in trying to correct any muscle imbalance that you may have. This type of stretching will help lengthen and reduce tension is tissues that are tight, or over active. As mentioned above, muscle imbalances can have a significant impact on your golf swing so it is very important to try and correct these with your golf fitness program. However, extensive static stretching is best performed either after your round or at a completely separate time altogether. Performing large amounts of static stretching prior to an activity can actually reduce muscle warmth and lead to less efficient muscle contractions. 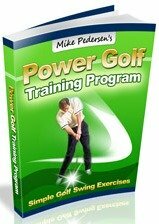 You will notice that I have included a handful of static exercises in my pre-round warmup, but there are a larger number of dynamic exercises present. Almost all of my "at home" golf stretches focus on static postures, where increasing tissue length is the ultimate goal. It has been found that even performing static exercises as little as twice a week can be effective in improving tissue length. Golf warmup exercises, in general, are more dynamic in nature where you are performing quick, or wide arcs of motion, simply trying to more blood flowing to the tissues. This increase in blood flow will help warm up the tissues, allowing them to more and contract more effectively. Finally, an active warmup will mimic those motions performed in each specific sport. For example, basketball players will perform exercises focusing on jumping and changes of direction whereas golfers should focus on trunk rotation and joint movement through the use of practice swings. Another great way to improve your flexibility is by trying yoga stretches. Not only is yoga more advanced stretching, but it also incorporates strengthening and balance as well for a full body workout. Its much more difficult than it may seem! There are way too many yoga stretches to list on these pages, but I will provide you with some basics to get you started. Take some advice from the pros! Get to the course a little early, hit a small bucket of balls if available, head to the putting green, and do a quick warmup before you head to the first tee. You'll be glad that you did! Do you know other flexibility exercises that would help golfers? Do you have a great stretch that is part of your routine? Share it with others! Note: Max size is 800x600.